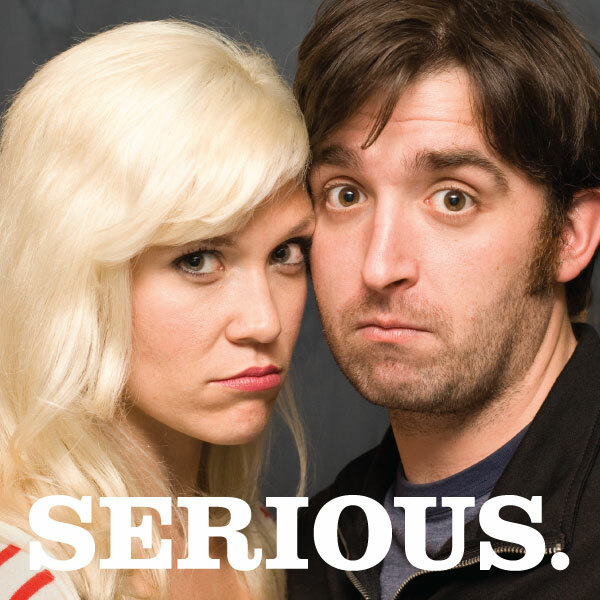 Carisa and Kevin are a sketch comedy and improv performing couple of live-together lovers. They’ve both performed with The Second City’s Boat Co on Norwegian Cruise Lines and are immersed in so many comedy-related activities in Chicago that we talked for close to two hours. We discuss hunting the most dangerous game, dramatic juggling and why The Second City is a good place to go on a date. • Kevin performs improv at iO on Fridays at midnight with Challenger, on Saturdays at 8pm with The Del Tones and on saturdays at 10:30pm with Chaos Theory. He is also performing with The Second City’s Red Tour Co.
• Carisa performs as Allie Wayes in Off Off Broadzway. They are currently performing a new show, We Changed Our Pannies! on Thursdays at 8pm from through May 19, 2011 at Stage 773. She also performs on with The Cupid Players at 10:30pm on Saturday nights at iO. • SMUSH is hosted by Liz McArthur on certain Tuesday nights at Stage 773. Both Kevin and Carisa will be performing in the next few months. • Carisa is one of the founders of Matter Dance Company. They will be performing June 9-11 at Stage 773. • The Green Hornet is available now on Blu-Ray and DVD. I haven’t seen it yet. • Carisa recommends Workaholics on Comedy Central, featuring Second City alumni Maribeth Monroe. • This episode was (unofficially) sponsored by Australian Shiraz wine. Posted in Comedy, PodcastsTagged Boat Co, Carisa Barreca, Challenger, Chaos Theory, Chicago, comedy, Cupid Players, improv, interview, iO, Kevin Sciretta, Let's Get Serious, Liz McArthur, Matter Dance Company, Norwegian Cruise Lines, Off Off Broadzway, podcast, Red Tour Co, Second City, sketch, SMUSH, Stage 773, The Del Tones, The Green Hornet, WorkaholicsBookmark the permalink. i mainly listen to this podcast for the theme song, but this is a pretty good episode.